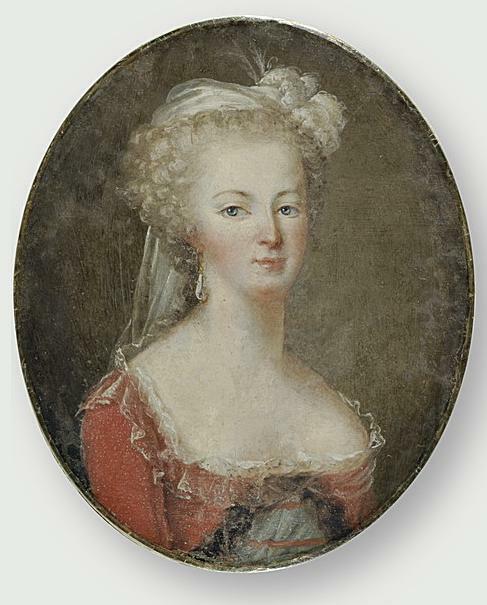 Anonymous, Portrait of Marie Antoinette. Miniature, cloth. Musée du Louvre. "When she went to the Louvre, on the exhibition of the pictures, she would run hastily over all the little imitative subjects, and come out, as she acknowledged, without having once raised her eyes to the grander compositions." Campan, Jeanne-Louise-Henriette. 1823. The Private life of Marie Antoinette Queen of France and Navarre. I would be curious to know how large and expansive the Louvre was in the 1780's than today, because I imagine it has acquired many new items since then. @andrew1860 me too, I love the red! @Emma I will not claim to be an authority on Louvre history (perhaps another reader can help out with this question!) But I am under the impression that at the time the Louvre was more of a working studio for artists to study and create, as well as holding many great works like today. I would love to hear some other reader input on this! I've never seen that picture! Wonderful!The Louvre was part of the Tuileries and at the time it had become more or less an apartment house for retired public officials and pensioners of the king. Louis XVI was the first king to open the Louvre to the public as a place to display the royal collection as well as new works of art. I'm just the same when I go to galleries, noticing the little things more than the big ones. Great miniature! How beautiful! Thank you for finding this. @elena maria vidal thanks for the info on the Louvre! Good to know! @Madame Constant of course! :o) it is the little things after all! @Frenchy agreed! I would like a miniature done after myself in a similar fashion... but I guess I will keep dreaming!